Upholding the rule of international law and defending Russia’s interests are as crucial to Vladimir Putin’s foreign policy today as they were 12 years ago. Whatever the opponents of Vladimir Putin say about him, he is definitely a pragmatic and predictable leader. Unlike his rivals who sit on the side of revolutionary romanticism, Mr Putin knew exactly where he would lead his country in the world. “Even before the elections, he drew the red lines in foreign policy that Russia would never cross,” says Alexander Rahr, director of the Berthold Beitz Centre at the German Council on Foreign Relations. “The president’s proposed foreign policy strategy for Russia in the third millennium consists of defending our national interests, rather than pandering to the interests of other countries,” explains Mikhail Margelov, chairman of the Federation Council’s Committee on Foreign Affairs. The Foreign Policy Concept of the Russian Federation, adopted 12 years ago during Mr Putin’s first presidential term, identified four main national priorities. First was strengthening international security based on the creation of a pan-European security and co-operation system. Second was forming a new world order in which the partnership between the world’s major powers is based exclusively on equality and mutual respect. Third, the Russian Foreign Ministry was tasked with creating favourable conditions for Russia in terms of international economic relations. Fourth, Russia would seek respect for human rights at the international level. None of these items has lost any relevance today. Since Mr Putin’s first inauguration, Russia has learnt to assess western initiatives soberly and impartially – and to say “no” to those that contradict its strategic interests. Not a trace of hope remains from Mr Putin’s first presidential term for a joint security framework in the North Atlantic space and faith in the effectiveness of the Russia-EU Permanent Partnership Council has now vanished. 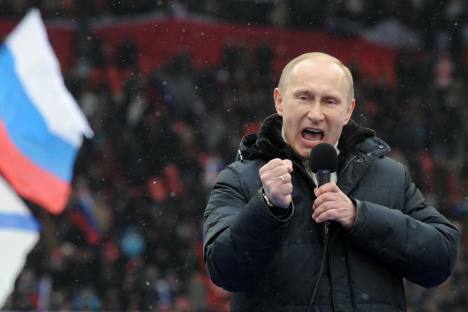 In 2012, Mr Putin has not budged an inch from his previous policies. His position has become tougher and even more aggressive, not in terms of potential military threats to any neighbours, but in upholding the fundamental principles of international law. He believes that western attempts to arbitrarily replace undesirable rulers under the pretext of protecting human rights (as happened in Libya), and to use humanitarian arguments to threaten foreign states (as is happening now in Syria), contradict the principles of international law. Addressing the UN Security Council in March, Russian Foreign Minister Sergei Lavrov described such actions as “risky recipes of geopolitical engineering” that threaten global stability. Russia’s confrontation with the West on these issues will remain. Russian political scientists believe that the future head of state will continue to demonstrate to the West that his international policy is guided solely by the interests of an independent Russia that intends to remain an independent player in the foreign policy field. Mr Putin will renounce participation in any international alliances in which Russia might be perceived as a junior partner. Over the past decades, Russia has outlined its range of interests and it will consistently protect them against any foreign intervention. Any country should understand that in wilfully invading Russia’s geopolitical space, it will automatically find itself in conflict with Russia. What Moscow does want is to preserve its political influence in the post-Soviet territory and it is now making plans to form a Eurasian Union based on shared economic interests. “The main ideas Putin has tried to get across in his responses to international questions are ideas of the country’s openness, its search for allies, and the rejection of Russia’s image as a bully,” says Nikolai Zlobin, director of Russian and Asian Programmes at the Centre for Defence Information in America. Western media often portrays Russia as an intransigent bogeyman allegedly defending undemocratic, dictatorial regimes. But Mr Putin describes the West’s wish to remove the idea of state sovereignty from the agenda and replace it with the idea of human rights as demagoguery. Mr Putin will, therefore, continue to protect the principles and values that allow people to determine their own future without outside interference. The challenges and threats that lie ahead in the coming years will force Russia to define its circle of allies and partners more clearly. Although Moscow has renounced the concept of a potential enemy in assessing other states, we can predict an intensified rivalry between Russia and the West under Mr Putin. This will apply above all to its relationship with the US. Mr Putin will never be resigned to Washington’s attempts to use anti-missile defence to mobilise members of Nato to advance America’s strategic interests. It sees such a unilateral approach as a threat to its security. The dialogue between Russia and the European Union will not be easy, either. If a united Europe continues to fearfully build border barriers to Russian business and delay the adoption of a visa-free regime, as well as perceive Moscow as a Trojan horse allegedly seeking to destroy the prosperity and moral principles of Europeans, we can forget about rapprochement. Mr Putin agrees to the idea of a common European home, mutatis mutandis , of course. But he does not intend to gatecrash his way into the European Union if these initiatives are met with no understanding by European partners. All the more so if they refuse to respect Russia’s concern over the American missile defence systems being deployed in Europe. For the next six years, the Russian president will develop a dialogue with China and other Asian countries. On the one hand, such co-operation allows Russia to avoid putting all its eggs in one basket and substantially expands its foreign policy options. On the other hand, Russia having an ally like Beijing forces the West to heed what is said in Moscow. This is a foreign policy situation which could be characterised as “Whatever China thinks, Russia speaks out about.” That is particularly true of issues connected to compliance with the principles of international law.